I am coming to understand this about photo impressionism: there is no one size fits all technique. You have to open your imagination and pre visualize the effect before pushing the shutter. You have to experiment. You have to push your boundaries. Photo impressionism has many faces. The soft focus approach is popular but I have never really given it a chance preferring to concentrate on multiple exposure and slow shutter images. A recent trip to New York changed that for me. The first technical challenge was understanding how to override the Nikon 1 V3’s powerful automated tools. The solution: use a DX lens and manual focus mode for better aperture and focus control. 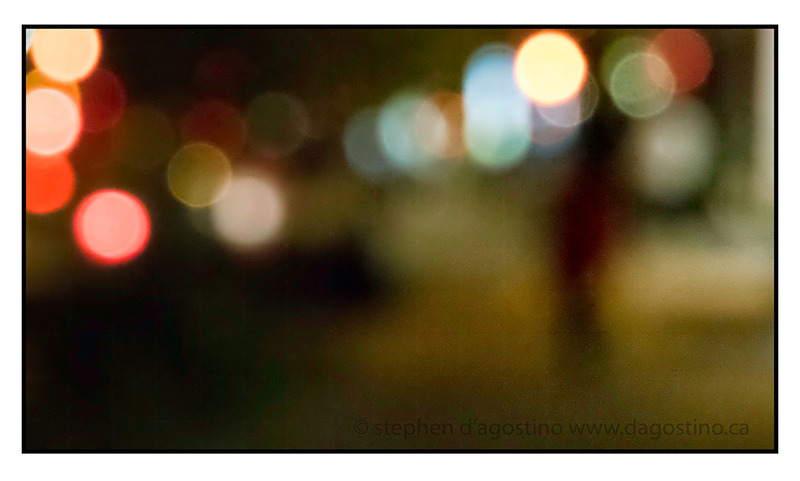 The buttery rich bokeh is a function of a large aperture setting. To a great extent I think this approach works because of the bokeh. At night the images become dream like. Colours that formerly defined background elements move to the forefront. Often they seem to dance. Look at the view of the World Trade Center below. The built form of the World Trade Center seems to melt into a pillar of light. For me it has become a lighthouse of hope, and strength overlooking the street below. I was excited to learn this morning that the curators of Flickr’s Explore page had added it to today’s list. I am coming to understand this about photo impressionism: there is no one size fits all technique. You have to open your imagination and pre visualize the effect before pushing the shutter. You have to experiment. You have to push your boundaries. I love it! A note about Flickr. I have and do use a number of photo sharing services to test reaction to my images. I keep coming back to Flickr because it seems to attract a broader aesthetic in its range of users. All of my images chosen for Explore are collected at https://www.flickr.com/photos/photo-impressionism/sets/72157638979727914/ My photo stream can be seen at flickr.com/photos/photo-impressionism/. This is a very interesting study because composition and mood become more important than the actual subject. Nice work. Interesting observation and true. I hadn’t looked at it that way because my focus (pun intended 🙂 ) was solely on capturing the mood of the moment. But stepping back composition is the critical element.